For many, the very thought of oysters sends them bolting straight to the opposite direction. I found this somewhat true in Taiwan where oyster pancakes, popcorn oysters, and dilled oyster fritters. Seriously, how can you not like oysters? This phenomenon only inflated when I came to Vancouver, yes, sushi capital of North America (sorry, Los Angeles), where I learned that two of my best friends mentally vomit when they see, not just oysters, but shellfish in general. And then I came to Waterloo, practically a fish desert. But then again, you can’t blame the region for being landlocked. And they do preserve fish very well, especially the oily Atlantic fishes such as mackerel, cod, and sardines. These are generally processed by means of smoking, salting, or confiting then canned. All of these concentrate the fish flavour into the intensity of shellfish. And when the same things are done to oysters, you essentially end up with the bacon of the sea. Except with the ever-welcomed addition of umami, the latest culinary beau. The key to mellowing the smoked oysters’ intense brininess (which is mostly concentrated in the oil) into a lovely umami base is by cooking it out. The baking then further transforms the flavour through caramelization and bringing out the sweetness of the cream. What you end up with is something so ridiculously addictive with a je ne sais quoi that nobody will suspect to have come from smoked oysters. To make the oyster bechamel, tip the oil from the oyster tin into a saucepan, reserving the oysters. Add the butter and heat until melted and beginning to sputter. Add the onions and fry without coloring until soft, about 3 to 4 minutes. Stir in the flour to form a paste, then gradually whisk in the cream a little at a time until smooth and creamy. Whisk in the water, nutmeg, and sea salt to taste. Remove from the heat. Transfer the bechamel to a blender, add the reserved oysters and puree until completely smooth. 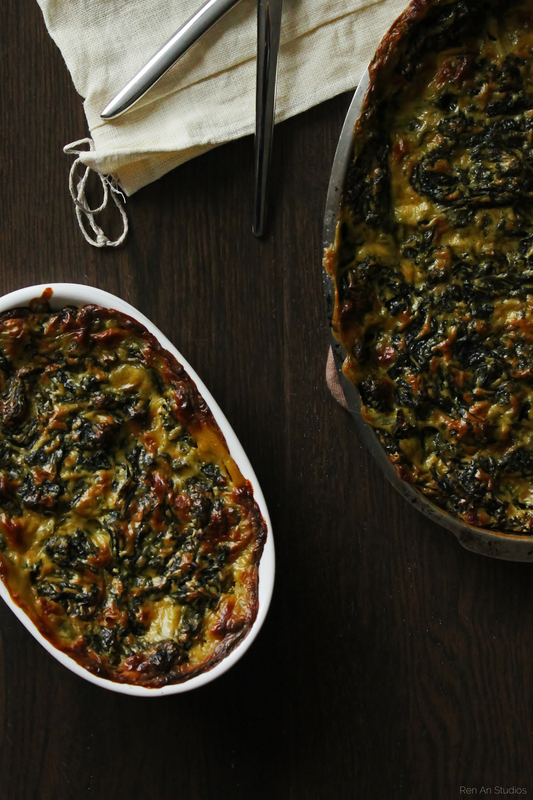 In a large bowl, mix the cooked kale thoroughly with the pureed sauce and spoon into a baking dish. Bake at 425 degrees F until golden and bubbly. Enjoy with whatever cool-weather offerings you plan to dish up!